Jaguar Doom source code released? Hey looks sweet, I'll check this out. I didn't think sources for console games could ever be released. Jaguar Doom easily had some of the best pre-PSX console lighting ever (read: realistic, not disco imp-style)...this is a very good thing. 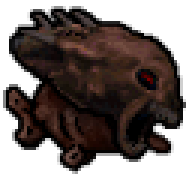 Not only that, but on Nightmare mode, the cacos were like machine guns. wierd console source code.. how would that be usefull?